We were lucky enough to be invited to a very special party on Friday – up in the hills behind Omiš, after a drive that is not for the feint hearted, but included spectacular views of the River Cetina gorge. The local festivities featured a special, and highly professional, presentation of the unique attractions of this inland region and the huge number of historical/cultural relics. As privileged foreign guests, at a party that was funded by and geared towards the local population, we agreed not to disclose the real treasures that were in the process of being researched, or the exact location. Very sensibly, those that are spending their valuable time, resources and expertise in discovering the true value of their heritage also want to preserve it for posterity. Thus, research is ongoing, protection of the area and its traditions is paramount, and the opening up of the region for tourism will be sensibly progressed. It was one of the most balanced, entrepreneurial yet considered, approaches to tourism that we have seen whilst we have been here and we aim to support it in the same spirit. The village festivities went on for three days with local Klapa music (multi part harmony singing) and much more besides. After the open air presentation, we were treated to the secrets of the local cuisine – for want of a better description, a huge spinach pancake, crisped on a large stone between red hot embers. That doesn’t do it justice but we will be revealing more in a future posting. Twelve competitors, many in local costume, and several carrying their culinary masterpiece on their heads (imagine the largest sombrero you can think of and it’s much bigger) vied for the title of the local equivalent of another Michelin star. They were accompanied, and frequently interrupted, by a “ringer” in drag. Only an excellent professional comedian can make children and foreigners, who don’t speak much Croatian, laugh out loud alongside the locals who understand the vernacular and dialect. After the awards ceremony, we all got to taste ample quantities of this special feast washed down by local wine and beer in copious quantities, all amidst green rolling hills and ancient stone houses. Whilst these thoughtful, hospitable and visionary experts and community leaders research and protect their heritage, for future generations and considerate tourists to enjoy, you can sample some of the delights of the region by walking the well signed mountain trails. The Tourist Mountaineering Guide Book and Map for the “Omiška Dinara” is available from the Split and Dalmatia County Tourist Board, www.dalmatia.hr, price about £10. You’d be well advised to do your research properly before embarking on such an excursion. There’s a lot to discover but the mountains and hinterland need to be treated with respect. It’s good to see that the non coastal areas are giving a lot of time and resources to preserving their heritage, and, at the same time, opening it up to discerning tourists. That’s coincided with an increasing number of searches, on this site, for more information on inland Croatia. After five years majoring on the coastal areas, we’re looking forward to discovering more about the mysteries of Croatian life and history away from the sea. It ain't half hot, but neighbouring Serbia has it worse at 44 degrees centigrade, and you're never far from the sea in Croatia. There's not much of a breeze and temperatures are set to climb back up as the week progresses. Sadly, the continuing heatwave has led to a number of fires breaking out. Primošten and Šolta Island, not far from Split, were badly affected yesterday with many residents of Šolta being evacuated. Needless to say, if you're visiting Croatia, be very careful not to contribute to the problem. On the plus side, Croatia is used to this problem (though major fires have not been an issue for the last two summers) and well equipped to deal with them. There are plenty of fire planes and helicopters who bomb fire outbreaks with water and normally get to them very quickly. 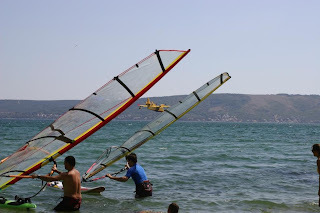 If you look carefully at today's photo, between the two windsurfers, you'll see a fire plane coming in to land on the sea, near Split, and pick up another load of water. Eagle eyed readers, who looked at Sunday's posting on chilling out, may have noticed the timetable and ferry for the service that operates between Okrug, on Čiovo island, and Trogir. It's a summer only service but the trips are regular and it's a much more pleasant way to travel. The alternative is the traffic jams over the bridge. Okrug is probably the most developed of the tourism destinations on Čiovo, with a great beach, some good restaurants and regular nightly entertainment. You can read plenty about Trogir in earlier postings. For ferries between Trogir, Slatine (also on Čiovo island) and Split, here's the direct link to our earlier posting - http://croatiaonline.blogspot.com/2007/06/croatia-online-travel-news-ferry-trogir.html. Click on the photo to get an enlarged version and read off the ferry times from Trogir. Hot, hot, hot! It's exceptionally warm at the moment with not a lot of breeze. However it's not muggy and the evenings do bring some relief. According to the forecast it's due to cool down a little next week. On the plus side, the sea is still crystal clear and refreshing, and the evenings are a great time to go to the beach. As luck would have it, Croatia Online's editor was in Zadar on Wednesday when the earthquake happened. As a first experience, it was more complexing than worrying - trying to find a reason for a rumble of about 3 seconds in the middle of a fairly serious meeting. The epicentre was about 40 miles away, in Kornati, and it measured 4.7 on the Richter scale, but, as far as we understand, no serious damage was done. Visitors should not be put off by this news - earthquakes do happen here infrequently but there hasn't been one with any serious impact for a number of years. More news next week - have a good weekend and enjoy your holidays. The Croatian currency is the “Kuna” which is subdivided into Lipa. I’m not making any guesses about the dollar at the moment but if you work out the Euro exchange rate to the dollar and use that, you want be far out. There are cashpoints/ATM’s everywhere – far more widely distributed that I can recall in England. In the unlikely event that you can’t find a cash point, the post office is your last resort. If you can’t find a post office then you really are in the back of beyond as there’s normally a post office for even the tiniest settlement. Check out the post office website http://www.posta.hr/ for the wide range of services they offer and the astounding geographical coverage of their branches. You'l find the English pages by clicking on "English" in the top left corner. Remember there are just 4.5 million people in Croatia and I’d bet that there are many more Croatian post offices, per capita, than there are English ones. An interesting statistic for a future posting maybe?! There also seem to be a lot more banks around than in England though no doubt “rationialisation” of the branches in remote locations will take place eventually as Croatia becomes more aligned with western Europe. Be prepared for long queues, non existent queues and occasional queue jumping. Going to the bank has become so frustrating and time consuming for us that we’ll do almost anything to avoid it. The one queue system, that is widespread in England, is rare here so you have to pick which assistant you think will get to you quickest which leads to a fair bit of jostling. Have your passport ready whatever type of transaction you want to make. If you want to learn more about the banking system the direct link is Croatia Online - The Banking System though this posting was written well over a year ago and we’ll be revisiting the subject in the Autumn. 10% is the norm though most locals just leave loose change at cafes and bars. We haven’t ever seen a service charge added to the bill but perhaps that happens in posher eateries than the ones we normally use. There’s normally a nominal charge made for bread in restaurants which, I suppose, acts as a sort of cover charge. We normally pay around 100 kunas a head for a main course, wine and coffee. We drink tap water not bottled water – you know you’re in a tourist joint when they insist they don’t do tap water. It’s lovely and perfectly drinkable except on some very remote islands that don’t have a mains water supply. House wine is about 60 kunas a litre but you can pay up to 1000 kunas a bottle for good Croatian wine, Zlatan Plavac being just one of them. Normally the house wine is perfectly acceptable but there’s no reason why you shouldn’t ask to try it first. The best steaks (bifstek) are typically 80 to 100 kunas, normally served with chips and perhaps a little greenery. Vegetable and salad side dishes are between 10 and 20 kunas. All sounds very reasonable so far? Watch out for fish! The mark up on fish is out of proportion to everything else in many places. It’s usually priced by the kilo, with a good sized sea bream (orada) or sea bass weighing about half a kilo, and can be anything from 250 to 350 kunas a kilo for a class I fish. Class I is supposed to mean that it has been fished locally on the same day, the alternative being frozen or farmed fish. However interpretations do tend to vary in some restaurants. The choice of deserts is normally limited to pancakes or ice cream – about 20 to 50 kunas depending on how exotic your choice is. Other drinks – the local brandy or firewater comes in various guises depending on what it’s made from – travarica, ohorovac (walnuts), etc – and costs about 10 kunas a shot. A coffee will be a little less. Expect to pay 10 kunas for a half pint in most places. Split Airport charges roughly double on all drinks, Hvar town seems to have a general cost of living 50% more expensive than anywhere else. The bread is lovely and very cheap – you can get half loaves if it’s a standard white or brown baton type loaf. Fruit and vegetables aren’t always that much cheaper than in UK but if you stick with seasonally available produce and pick your market lady wisely, you’ll pay much less. You’ll certainly notice the difference in taste. Meat is a little cheaper and fish, compared to what you’ll pay in a restaurant, is a bargain. Clothes, shoes, etc are similar in price unless you find a bargain in the market. Furniture and white goods are good value. Most of the entertainment during the summer festivals is free. There’s not an awful lot else around to spend your money on in this respect. The price of excursions, boat trips, etc, unless organised by major travel agents, can sometimes be down to your negotiating skills. A bit of a tourist trap and similar prices to England so ask for the price first. Possibly politically and socially incorrect to mention this, given the recent smoking ban in the UK, but cigarettes are around 15 kunas a packet. Finally, just to put this all in perspective, an article in this week’s Slobodna Dalmacia, a national daily newspaper, reports that the Croatian cost of living is 89% of the European average - lower than Switzerland and Denmark, both at 142%, but higher than Holland at 88%. Slovenia was 87%, Montenegro 74% and Bulgaria 56%. England did not feature in the article. We stumbled across a fascinating website over the weekend. It's primarily genealogy based but has a mine of other information including travel, food, books, etc. It's written from a US perspective and therefore provides an angle that US readers of this Brit based blog may not easily find. If you have any Croatian ancestors and want to benefit from someone else's experience of tracing them, then this site will be of enormous help. Although based in California, the site's editor is a frequent visitor to Croatia and one of the main contributors, Robert Jerin, organises regular cruises in Croatia with a special genealogy focus. Visit http://www.croatia-in-english.com/ to benefit from someone else's hard work and some great information on Croatia.